The Lady Cards remain perfect in the Landmark Conference following their fifth straight league win. The 20-1 home victory over the Gophers of Goucher College brings the team’s records to 9-6 (5-0) overall. It took the Catholic team less than a minute into the game before rookie Sydney Hartman found the back of the net. The rookie would kick off an 11-0 run for CUA, which would take a very comfortable 14-1 lead at the half. The 17th ranked team in Division-III had 11 different goal scorers; chief among them being sophomore Holly Regan, who posted game highs with 7 points on 4 goals and 3 assists. Regan now has 52 total points on 24 goals and 28 assists while shooting 53.3% (84.4% SOG) on the year. Classmate Katie Bradbury scored three times with 1 assist. Junior Molly Kelly also recorded 4 points on 2 goals and 2 assists. Hartman, classmate Bridget Beck, and sophomore Ally Criscuolo all scored a goal each. Catholic won the draw controls battle on the day, winning 19 of 21. Freshman Emily Bynoe led the game with 10 victories. Kelly, Bradbury, and sophomore Casey Ryan all recovered 4 ground balls. Classmate Wendy El forced a team-high 4 turnovers while scoring once. Senior Nicolette Crisalli scored twice and had 1 assist, while sophomore Nicole DiFabio also recorded a goal and an assist each. The Cardinals will host the Greyhounds on Saturday, April 21st at 1 PM at Cardinal Stadium. Moravian sits at 10-3 overall, with a 4-1 record in the conference and will likely be the Cardinals’ opponent in this year’s conference championship. 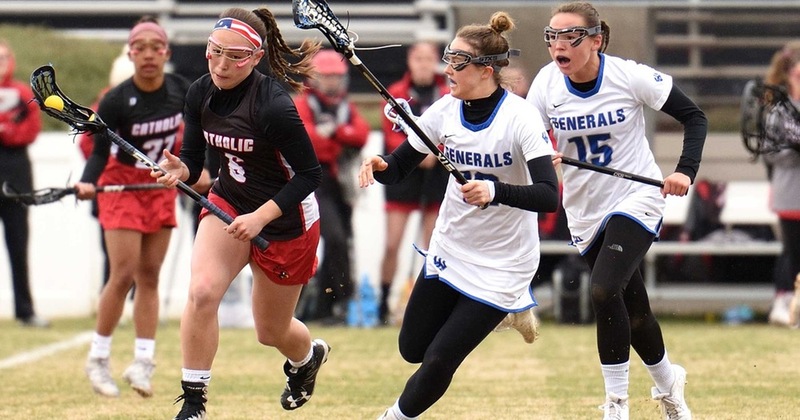 Catholic fans can rest easy however, since four of the squad’s five losses have come against nationally-ranked teams and as many were decided by 4 goals or less. The team has also picked up huge wins over tough competition including a 16-10 win over #21 St. Mary’s (Md.) at the top of the season. The team has two more conference games, but a win on Saturday will secure the top seed in the postseason.